Time passes. For this photographer digital imaging has brought black and white photography back into the frame (sic) without the need for a darkroom and without the doubtful benefits of toxic chemicals and dermatitis. ​This does not imply any disrespect for the masters of film, as a visit to the Bookshop will show. Digital is just a horse for my particular course. The high outcrops of Garn Fawr and Garn Fechan overlooking Strumble Head, captured from the Wales Coast Path. Fishguard Bay is over the horizon to the north. Stone hedges segregate rich pastures from coastal moorland and high sea cliffs. Looking across the Pembrokeshire farmlands of Pen Caer towards Dinas Head and Dinas Mountain on the far right horizon. The hinterland of Fishguard Bay. Tŷ Canol National Nature Reserve. Taken from the footpath leading down to the extensive ancient woodland. Close by the hamlet of Brynberian and the Neolithic cromlech at Pentre Ifan. Pen Caer from Garnwnda. 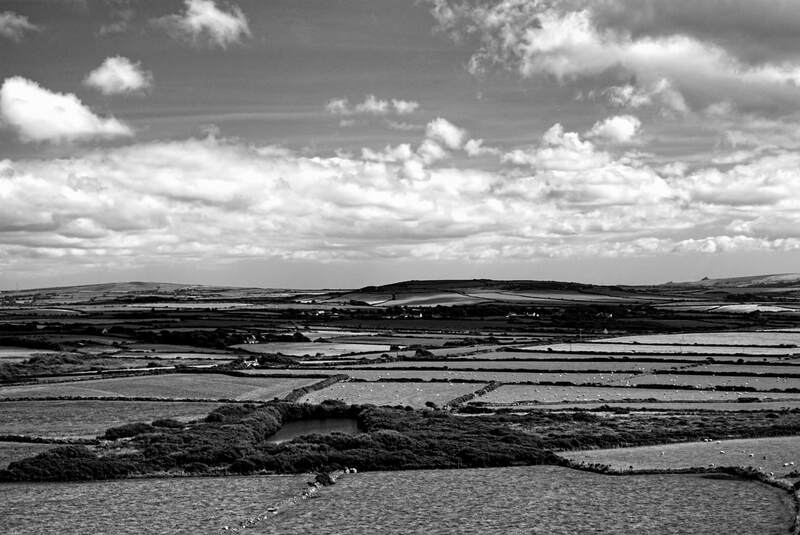 Strumble Head was the site of the last invasion of Britain, which was thwarted by Fishguard women in traditional dress. The finger stone marks the location of an earth-fast burial chamber. Winter Light, Abstract Forms. 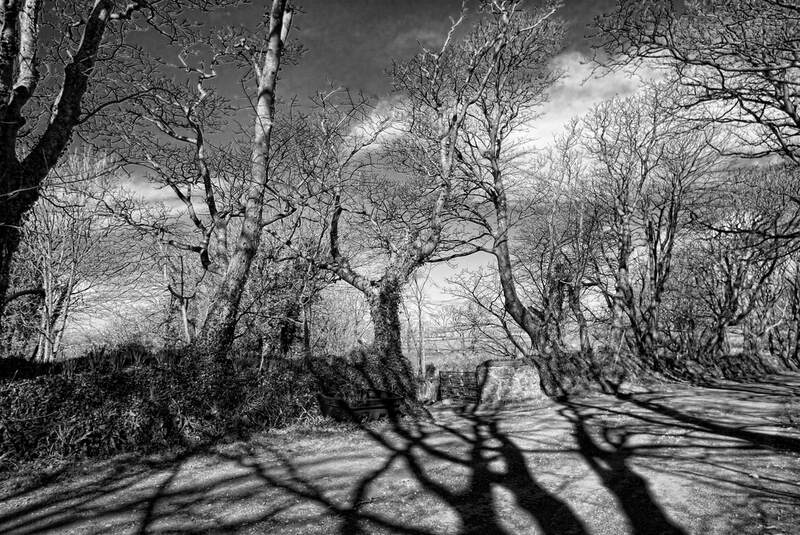 The midday midwinter sun casts long shadows from behind the camera, to merge with patterns in the shot. Days like this can be hard to find in Pembrokeshire winters. This was captured three days after the biggest snowfall for several years. It lasted overnight. Click on the image for purchase options. Across the Borderline ... and into Ceredigion ... A black and white rendition of the source of the River Teifi, high in the Cambrian Mountains at Teifi Pools. 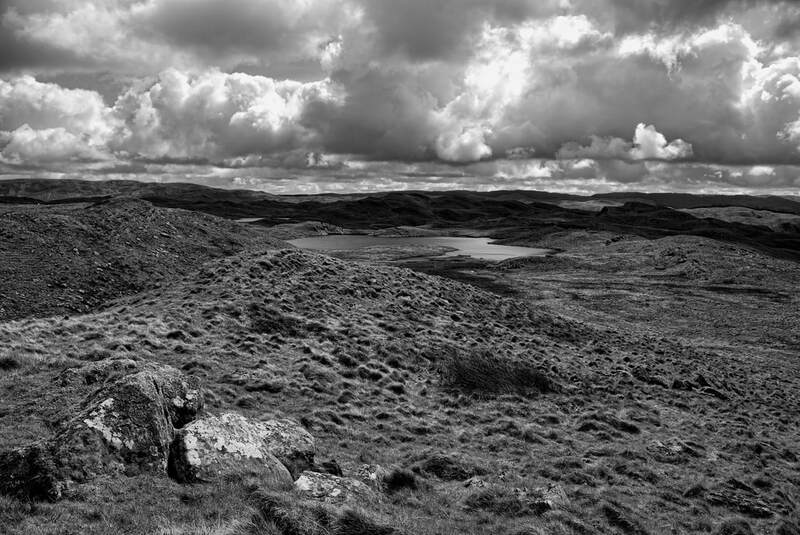 The cluster of lakes, Llyn Teifi, Llyn Hir, Llyn Gorlan, and Llyn Egnant, sit in a sodden peat landscape under brooding skies. The Pools can be reached by a small road from Ffair Rhos, close to Pontrhydfendigaid, running to the North of the Pools. There are a number of colour captures on my landscape page. Click on the image for purchase options. Preseli Backdrop #1. 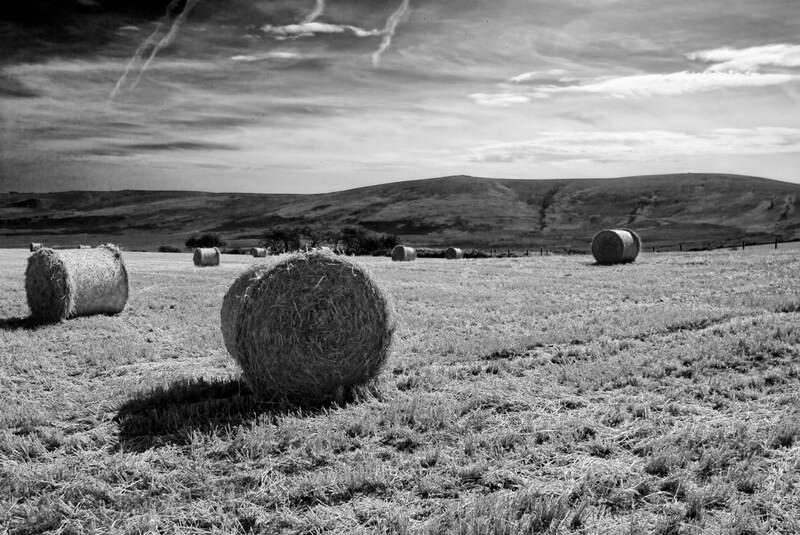 B&W conversion of the image on my landscape page. 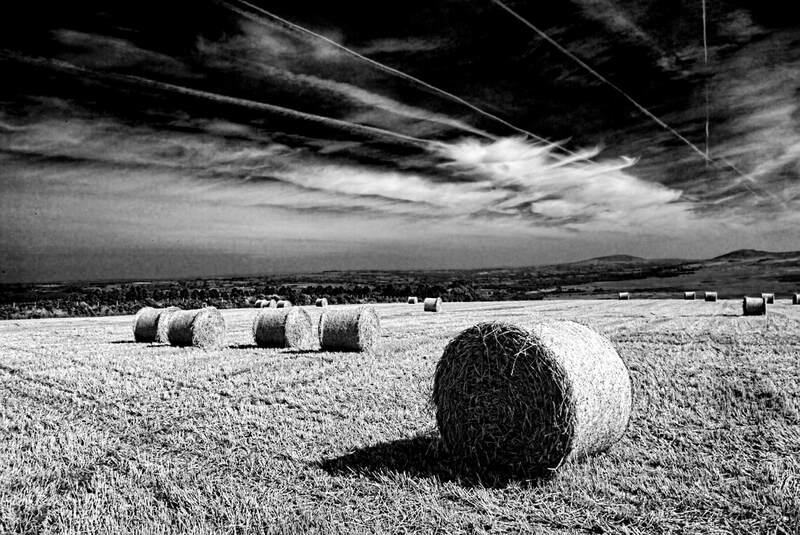 Straw bails and vapour trails! Click on the image for purchase options. Preseli Backdrop #2. From the slopes of the Gwaun Valley towards the Preseli Hills. Click on the image for purchase options. At Carnfathach. Sometimes topography wins! The Wales Coast Path is occasionally forced inland by vertiginous sea cliffs. At Carnfathach this involves an ascending diversion followed by a descent to Carregwastad to the west. Carregwastad was the landing point for the 'Last Invasion of Britain', by the French in 1797. This section is between Goodwick and Strumble Head, just north of Llanwnda. Click on the image for purchase options. Autumn, Little Milford Woods. A patch of unmanaged woodland close to the Milford Haven Waterway in Pembrokeshire. Captured in autumn light. Garn Gilfach from the Wales Coast Path. 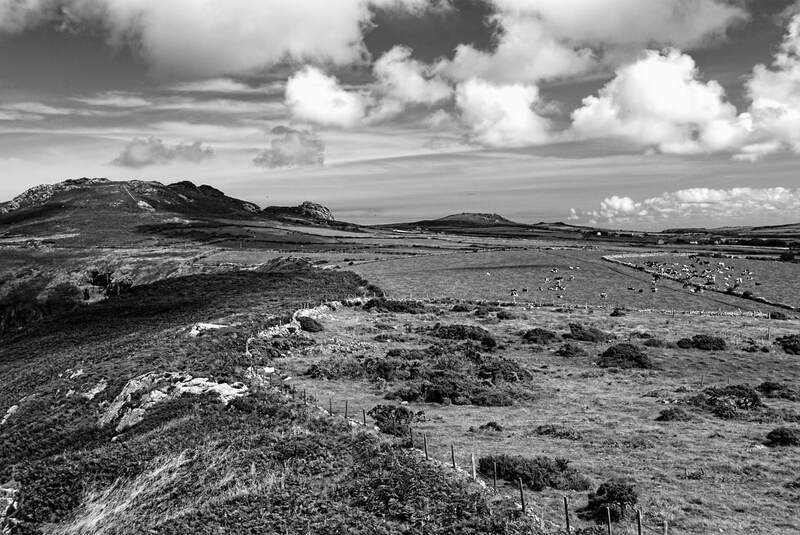 The high outcrops of Garn Gilfach, Garn Fechan and Garn Fawr from the Wales Coast Path on Strumble Head.